This Tree of Life splashback had every detail of its branches and leaves carefully cut and arranged by hand. Instead of a single colour applied across the entire panel, our splashbacks tend to take on much more of an intricately detailed, painterly style. We do have an incredibly talented artist in the form of Lisa, of course, and it shows! From our classic designs to the completely original ones dreamt up by customers, you’ll always be able to see countless little details in the glass. Just like brush strokes on traditional canvas, even the texture created by the enamel powder we use is a sight to behold. What’s more, no two pieces are ever the same. Even if the designs are similar or inspired by one another, the way that the powder falls is never quite the same, and even the fusing process has some irregularity to it. The end result will always be absolutely jaw dropping, and it will be a one-of-a-kind piece no matter what. If that sounds like just the thing you’ve been looking to put in your home, then what are you waiting for? The House of Ugly Fish is a name that has long been associated with nothing but the finest quality products. 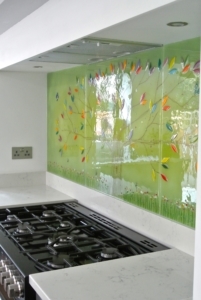 As market leaders in everything to do with handmade glass art, bespoke kitchen splashbacks and more, we specialise in completely unique and personalised works of fused glass from small drinks coasters all the way to grand wall art installations and more, so you’re sure to find something that’s right for you. Why not get in touch today? Your perfect piece of fused glass art is just a few steps away from becoming reality!